2015 - Acclaim Press. Back in the day when music was created by talented people who played actual musical instruments and song smiths who could create a song from nothing, there was a band named "The Exiles." Founded by J.P. Pennington in the heart of Kentucky in 1963, this band shortened its name in 1973 to Exile. In 1978, the band hit their peak with their hit song "Kiss You All Over." They continued their Pop career with some minor successes, but nothing like that of the success garnered from their signature song. Then in 1983, with the help from a new producer, they crossed over into country music. It was then that they gained more success with hits like "Woke Up In Love," "I Don't Want To Be A Memory," "Give Me One More Chance," "Crazy For Your Love," "She's A Miracle," "Hang On To Your Heart," "I Could Get Used To You," "It'll Be Me," "She's Too Good To Be True," and "I Can't Get Close Enough." Over the years, the band went through at least thirty-five band members. The band as a whole went through many difficult times brought on by success, loss members, stress and strains of the music industry that eventually brought them to disband in 1993. In 1995, an impromptu meeting caused former members J.P. Pennington and Les Taylor to seriously discuss getting the band back together. The two resurrected the Exile name, however, in 2006, Taylor announced that he was leaving the band. But two years later, Pennington, Taylor, Sonny LeMaire, Marlon Hargis and Steve Goetzman had reunited with plans of a tour and new album. 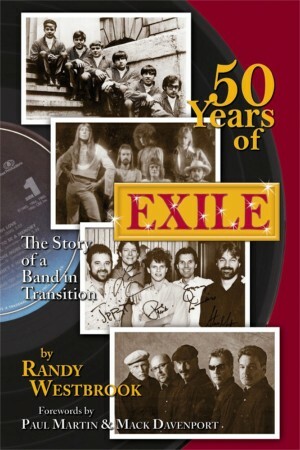 In the fall of 2015, a local musician by the name of Randy Westbrook took it upon himself to capture the story of the band Exile in his new book called 50 Years of Exile: The Story of a Band In Transition. In hindsight, this book does capture the story, while it includes the biographies of all the members of the band. Through out the years of Exile, thirty-five musicians took part in the history that is this band. However, the book does not capture the true nature of this band. In fact, it often produces a negative vibe. The problem is not with Exile as a band, for many bands tend to go through various musicians to create a vast collective talent. The issue lies within the writing. Mr. Westbrook narrates the story without the use of a solid timeline. In reading this book, I am reminded of the 1988 Chevy Chase movie Funny Farm. In the movie, Chevy's character "Andy" is a writer who writes a book that includes a time line that flashes forward, backward and even sideways. The Exile book contains a similar timeline. In all there are only nine chapters in this book, when a good writer would have at least had thirty-five. I have to praise him on including each member of the band, however, he introduces them in such a way that makes the reader question what actually happened sequentially with the band. For the most part, this book is written in a journalist aspect and not as the biography that it should have been. As one reads this book, it gives you the impression that this band was not at all successful. 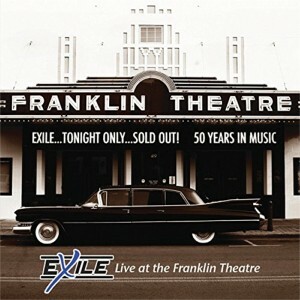 On the flip side, Exile also released a new album called Exile: Live At The Franklin Theatre. Released on Fuel Records, this album features a collection of Exile's most beloved and prosperous songs. J.P. Pennington teams up with Sonny LeMaire, Marlon Hargis, Les Taylor and Steve Goetzman to create this memento. This album comprises of thirteen songs including "Give Me One More Chance," "It'll Be Me," "I Could Get Used To You," "Woke Up In Love," "She's Too Good To Be True," "She's A Miracle," "Nobody's Talking," and "Keep It In The Middle of The Road." The album also includes two medleys; one of which includes songs that were written by the band but were recorded by other artists. Through the hits on this album, there are two songs that stand out. The first is their version of The Impressions' 1965 song "People Get Ready." The second is a song that many will remember as it was a hit song from the 1996 Adam Sandler movie Happy Gilmore and is the band's signature song "Kiss You All Over." It is really nice to hear these songs again as they remind us of the real talent that this popular band maintained throughout their years in the industry. However, the live recording is quite dull and lacks the excitement that comes with a live performance. I strike this up to a problem with production rather than a problem with the performance. After reading the book and listening to the new album, I have come to the conclusion that this band was plagued with many misfortunes. Several times in the book, members are quoted saying that they would have done things differently. Personally, if I were part of this band, I would have not agreed to the book that was written. Reading this book was like walking in knee high mud, while trying to navigate the shortest distance. It was quite stagnate as it was based on facts with what seemed like very little input by the band. In fact I can honestly say that this was written by a fan who had insufficient information about this band. However, it does give the reader a glimpse into the hard life of a musician. The album, on the other hand, is a wonderful reminder of the music this band created. If I were to choose between the two projects? I would certainly choose the album and let the book stay on the shelf. Nonetheless, if my financial situation was tight - I would say 'no' to both.